Amazon Music has been given a 90s makeover to honour the 20th anniversary of the band's classic 'Definitely Maybe' album, the front page is a plethora of nostalgic icons and fonts. As well as featuring the look of the 90s the homepage also shows you the tracks that hit the charts from Prodigy's 'Music for the jilted generation' album and Pulp's 'His 'N' Hers'. If that wasn't enough there's an album and singles chart as well as a full list of all the Brits winners from 1994. Hopefully that's enough to tame your nostalgic needs but if not then don't worry as they've picked the biggest films from '94 as well including Mrs Doubtfire and Ace Ventura. Sold? 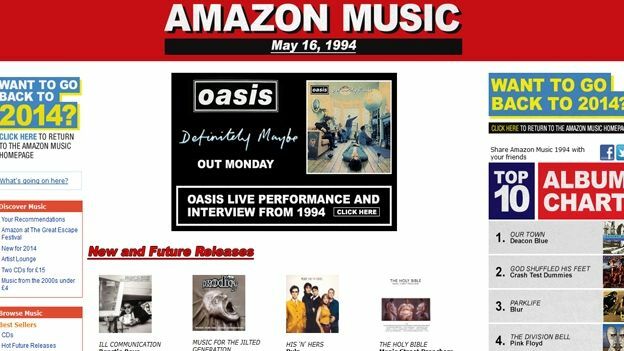 Check it out here, there's no word on how long Amazon plans to keep the homepage that way so go forth, drink in the nostalgia and remember the days of Adidas tracksuits, singles on cassettes and John Major being, well, John Major.